Fall Fishing the BC Interior for Fat Kamloops Rainbow Trout! You are Here: Home >> Blog Posts >> Fishing Reports >> Fall Fishing for Fat Fish! My Mid October Fatso Rainbow Trout! Unfortunately, the fishing was not as fast and furious as I had expected 🙁 but it wasn’t terrible either. I started the morning at an area on the lake where we had got into some better than average bows earlier in the year. I floated a triple F leech under an indicator on one line while casting and stripping another on a wet line but only managed one small 1.5 pound little dink there. I decided it was time to move …. The second spot I chose was at the opposite end of the lake and in a bit shallower water. I cruised the area until I saw some fish moving then quietly glided in and dropped anchors. My plan was to keep the good old triple F leech under the indicator but switch to a shrimp on the sinker. I dropped the leech over the side of the boat to check for depth and I couldn’t believe it when I felt a fish take the fly! 😯 Unreal! And just like ice fishing I hand bombed a little bow to the boat where I carefully released him unharmed! Well now I was pumped! I hadn’t even got a cast out and I already had a fish on just checking my depth! This was bound to be the spot right … hmm … or so I thought. The next hour or so was on and off fishing with only one mentionable rainbow trout to the boat (see picture above). But that’s fall fishing … sometimes it’s gang busters and sometimes you really have to work for them … today was the latter. All in all it was a beautiful fall day on the water with about 8 fish to the boat and one lunker … I wouldn’t have traded it for the world! 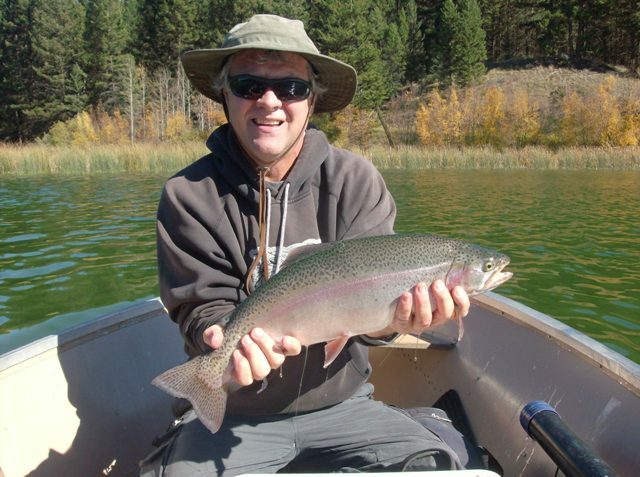 This entry was posted in Fishing Reports and tagged BC Interior Fall Fishing Report, Fly Fishing Rainbow Trout. Bookmark the permalink.